I hope all my American readers had a wonderful Thanksgiving! On Friday evening we had Christopher's work Christmas party. We went to The 4 Seasons. It's a pretty casual place, but we dressed up anyway; we love to dress up! We shared some onion rings, and a little pizza, and ordered a lasagna too, but ended up taking basically the whole thing home. We had a fun evening, and were home pretty early. We had a busy Saturday Christmas shopping for our family. We were out until close to 9:00 p.m., and then made a yummy Korean ramen soup. On Sunday we cleaned the house, and ate poutine for lunch. We used homemade beef gravy, with cheese and homemade fries. We didn't need to get much for groceries on Sunday, as we have a pretty full freezer, which we stocked all Fall with bulk meats, perogies, loaves of bread, loaves of cornbread, some chickens, etc..
We pulled chicken out for dinner last night, and had salad on the side. I have a fun new partnership to announce tomorrow, and a BIG giveaway. Check back tomorrow for details. How was your weekend? What did you do? Have you started Christmas shopping? On Sunday evening we cooked up a big pot of spaghetti and a meat sauce. 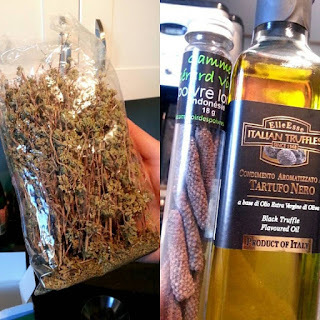 We used some new ingredients we picked up recently, including Indonesian long pepper, Italian black truffle oil, and organic, mountain oregano. In addition to that we added a couple splashes of red wine, Parmesan cheese, tomato products, onion, garlic, more spices, and the meat of course. Spaghetti is one of my all-time favourite meals. On Monday evening we had perogies (Indian fusion) with the potato/pea mixture spiced like a samosa. We topped them with sour cream and green onions. They were really good, but next time we'd add more spices to the mixture; they weren't strong enough for us. Last night we made a roast beef dinner. We did the roast in the oven, with potatoes. We used the drippings from the roast to make gravy. I've always made gravy from scratch - it really is easy to do. When I was a kid my parents often put me in charge of the gravy (usually for Turkey dinners), so I've been making it for at least a good 20 some years. We also whipped up some Yorkshire pudding. It had been years since I had made Yorkshire pudding (12 years actually), but I remember my mom making them a lot, and Christopher grew up eating them all the time, and I remembered them being really easy to make. I was right. They turned out beautifully - super soft, but also perfectly crispy at the same time. The potatoes are hiding in the picture, but they were just quartered potatoes, seasoned, and cooked in a bit of flavoured olive oil. What have you been cooking this week? Do you like Yorkshire pudding? Have you ever made them? We've been spoiled with weather all year, but it finally got a bit cold this past week. And windy. Really, really windy. Christopher's been working long days, with a lot of heavy lifting, and we've both been really tired lately. I think the change in weather takes a lot out of us ... hence, our homebody weekends. We did a lot of cleaning/purging yesterday in the basement, and later snacked on nachos. And then in the evening some smoked salmon with cream cheese, and paratha, while we played a couple games of chess. This morning we enjoyed wife saver breakfast, and old recipe, and a classic one-dish breakfast. Butter a 9x13 glass dish. Lay 8 pieces of bread, covering the bottom. Cover that with a layer of thinly sliced (half inch or so) ham. Cover that with shredded cheese. Then put the next layer of bread on top. Sprinkle with the green onion and bell peppers. Beat the eggs, salt and pepper, and dry mustard. Add the milk, worcestershire, and Tabasco, and beat well. Pour over top of the layers. Cover, and let stand in fridge overnight (or freeze). In the morning, melt 1/4 cup of butter, and pour over. Crunch up some cornflakes over the top. Cook UNCOVERED for 90 minutes - 2 hours @ 350 F. Let sit 8-10 minutes before serving. It's perfect for Christmas morning, or whenever you don't want to spend the morning in the kitchen. How was your weekend? What did you do? Is it getting cold where you are? Have you ever had wife saver breakfast? Our eats last week were pretty simple - turkey leftovers! We ate turkey all week, and didn't even come close to getting sick of it. I got home a bit later than Christopher on Wednesday, and when I walked into the house, it smelled soooooooooo good. He had started on a flavourful turkey stock. We used it to make soup, with noodles, carrots, celery, and hominy. A couple weeks ago we purged a bunch of stuff from the house. I went through bins that have been under the stairs for years, and basically threw out their entire contents. We don't want any unused objects, things, junk, weighing us down. We're not overly sentimental about stuff, and are really trying to minimize, and not accumulate. It's time to clear our space. We plan to do more purging this weekend, and instead of cooking big meals, we decided to mostly have a snacky weekend. There were meatballs, fried pickles, smoked oysters, cheese and crackers, and baked brie. After breakfast this morning, the rest of our day will include snacks, records, drumming, purging junk, and watching movies. We spent the weekend celebrating! One of the reasons we got married on Friday the 13th (February), was because we both love the date, and thought it would then be fun to celebrate every time it's a Friday the 13th. On Friday we picked up some tasty bevvies, and planned a delicious menu for the weekend. Our favourite way to celebrate is with music, food, and drink, at home. We leave the house and drive all week - it's so nice not to have to do that on the weekend. We stuffed the turkey with a cornbread stuffing, and also had mashed potatoes, beets, carrots, and a perfect, homemade gravy. Although this looks like a lot of cooking, none of it was very labour intensive, so we actually didn't spend too much time in the kitchen this weekend. Since it's no-spend-November, we're happy to have leftovers to last most of the week. We had a giggly, silly, fun weekend, and even managed to stay up until about 3:00 a.m. on Saturday night watching YouTube videos, and visiting. I love our weekends like this. Did you cook anything yummy on the weekend? On Wednesday evening we had two of our closest friends, Christopher's brother Steve, and his wife Melody over for dinner. We couldn't believe it had been almost a year since we had them over. We all went to the same elementary school, and have been close friends since childhood. The cute thing about Mel and Steve (besides everything) is that they were standing side by side in our grade four school picture, and now they're married. Adorable. I love love. In case you haven't noticed. Anyway, they came over early and we ate for hours. That's just what we do around here. The next course was a mini Southern-BBQ snack, with two BBQ ribs, and a little piece of my fresh, buttermilk cornbread. Christopher whipped up the BBQ sauce, without a recipe, but it turned out perfectly. I'll get him to jot something down next time. We did the ribs in the slow-cooker all day. Next, was a cauliflower soup. We made the soup the night before, because soup is always better the next day. We then let it simmer, very, very low, all day. The main course was a perfect combination of dishes: fried chicken, coleslaw, mac & cheese, and baked beans. Ahhhhh yeaaaah! Talkin' 'bout comfort food. Well, I'm thinking our guests left full ... and that's always a good thing. Happy Friday everyone! What do y'all have planned for the weekend? (I'm southern now, I can say y'all).